Guy Anderson, portfolio manager, looks at the UK small and mid cap sector and wonders if these often overlooked stocks can continue to defy expectations. Despite continued negative investor sentiment towards the UK, much of which is driven by the uncertainty emanating on an almost daily basis from the Brexit negotiations, domestic-oriented medium and small sized companies outperformed their larger and more internationally exposed counterparts last year1. While this performance was unexpected by many market commentators, it was not actually an anomaly. Over the past 60 years, UK mid and small caps have outperformed in two years out of every three. What’s more, this phenomenon is mirrored in other markets around the world and, we believe, there is no reason why it shouldn’t continue. Less well-researched stocks with the potential for active managers to identify significant market mispricings. The UK mid and small cap sector is also an incredibly diverse and dynamic part of the market, ranging from fledgling companies in exciting new industries to established global leaders in their specific niches. Therein lies a wealth of opportunity for experienced stock pickers. Across this exciting spectrum of companies we search for those with some combination of the following characteristics: attractively valued, operating in growing end markets, sustainable competitive advantages and either approaching, or undergoing, a period of positive change. Most importantly, we seek to identify opportunities where we see a dislocation between market expectations and the likely outcome. We believe this approach can consistently identify attractively valued stocks across the mid and small cap sector of the market. Despite the continued uncertainty over Brexit, we believe mid and small caps remain well positioned. It would be easy to focus on all the negative factors that are constantly being dragged through the press, just as we could have done last year. However, it would be opportune to step back and think about reality, and not just perception. That’s not to say that there aren’t any risks around Brexit, while the UK economy does carry the hallmarks of being in the late cycle, so one must be alert to this. But there are positives too. For example, the UK economy has been more resilient than almost anyone expected and is supported by a global economy that is picking up growth across the board. Set against low expectations, and with the structural drivers of long-term outperformance2 remaining as valid today as at any other time in the last 60 years, perhaps mid and small caps can continue to defy expectations. *Please note that past performance is not a reliable indicator of current and future results. 2 Source: Numis Smaller Companies Index 2017 Annual Review – Numis/Elroy Dimson, Scott Evans and Paul Marsh – London Business School. NSCI = Numis Smaller Companies Index. The NSCI covers the bottom ten percent of the UK equity market. Study published 16th January 2018. 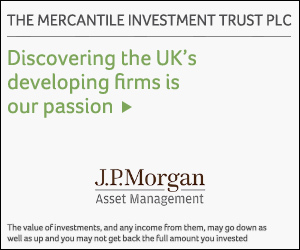 Guy Anderson is portfolio manager of The Mercantile Investment Trust within J.P. Morgan Asset Management's UK Equity team.